By now, I think most all of us have seen the video of this polar bear during what were likely his last hours of survival or almost certainly his last breathing day. The polar bear was filmed by wildlife photographers Paul Nicklen and Cristina Mittermerier, upon their arrival to Baffin Island, in the Canadian territory of Nunavut. Both Nicklen and Cristina are biologists and co-founders of the conservation group Sea Legacy. The video was released by National Geographic and intentionally headlined to emphasize the catastrophic ecological suffering that climate change will spread across our polar habitats. As predicted, the plight of the dying bear is now almost entirely overshadowed by the hostile politics of global climate change (which shouldn’t be so divisive and maybe wouldn’t have become so divisive if more people understood the difference between weather and climate). In any case, outside of the predictable political debate that seemingly infests every issue we face, I was disturbed by society’s reaction to the video—the original post shared by National Geographic and other associated posts shared throughout social media, all follow with comment threads furiously rich in emotional response void of any knowledgable debate or even reasonable conclusion to the situation. I cannot help except to relate this scenario back to our own current issue in Arizona, where we are facing a voter initiative created and promoted by HSUS to ban all wild cat hunting. As some of us try to explain and debate responsible predator management with anti-hunting activists, this sort of ignorance is what we are up against; people who have no knowledge of the difficulty in rescuing such a wild animal in such a remote location, people who have no working experience in how precarious and nearly impossible it can be to reach a positive outcome for such a severely malnourished and atrophied animal even when applying the best refeeding protocol, people who were not taught to question the information being delivered to them (the bear was never actually diagnosed and though he was certainly starving, his starvation could have been due to any number of diseases or injuries). Most importantly, I’m listening to people who have never witnessed a wild animal struggling to survive in any capacity and certainly they have never witnessed a wild animal battling starvation. Why is that important for me to take note? Because that is often how predators die. They don’t just lay down one sunny morning and peacefully close their eyes, in perfect health and vitality. They succumb to injuries or old age, but starvation is almost always going to be the last adversary they fight. And while it is a part of life, it is an absolutely wretched one. And it is so terribly slow. Many times, I have asked an anti-hunting activist if they have witnessed a wild animal starving to death and I have asked them, why do they prefer such prolonged suffering as opposed to a much quicker and cleaner death by a human hunter? If you were given the choice, how would you prefer to die? Because the mountain lion, like the polar bear, has no natural predators to ease its pain. Humans can fill that role and I believe that we should, just as the mountain lion or polar bear can fill that role for the deer or seal. At its best, ethical and fair chase hunting of predators is a gift. It goes without saying that as humans, we must strive to be as honest and honorable as we can while taking part, thereby deserving to be the bearers of such a gift. But hunting is certainly a positive role we can play considering the interdependence of species, of which we are very much a part! So, keep passing this video along. Remind people that this is what starvation looks like. For most predators, this is what death looks like. Let us be thankful that we can have the choice to step in and ease this suffering for such Kings and Queens of nature’s realm, often before they ever must crawl in the dark of such misery. Where is the power that made you your pride? Brother, I go to my lair to die. There is an equine supplement recently marketed heavily to me on my Facebook profile, that generates many broad claims regarding the benefits it can provide and the various ailments it can cure; faster recovery, increased stamina, calmer and more focused mind, refined muscle condition, repaired bone, improved and advanced healing. It is helping horses with ulcers, founder, allergies, and apparently even issues that would normally be assisted by consistent training. That is quite a list, yes? It must be a miracle supplement! But on further investigation, the supplement amounts to an amino acid stacking. And it’ll certainly cost you! I started thinking again about how I prefer to feed whole foods to my horses, that I prefer to offer them a selection and variety of feeds in addition to quality grass hay, allowing them to decide what they need and when they need it. I do not think the more common practice of adding broad spectrum supplements to our horses’ diet is necessarily wrong and it can certainly be an easier and less time consuming option, depending how you look at it. However, I do wonder how many issues of imbalance we may be causing when we broadly force feeding supplements without consideration to individual requirements; requirements that change throughout the year and can absolutely vary between particular horses. I do prefer to always listen to my horses and respect their choices. In the past, I have been fortunate enough to allow my horses turnout on vast acreage, during which I often spend time with the herd just walking or sitting while they browse and graze around me. I’m also a great fan of taking my horses for walks on the lead whenever it suits me, which is a lot now that I am a single mother with a son still too young to ride along on his own horse. During both times, I have always been interested to watch horses carefully select various wild plants through the changing of the seasons and through the journey of their overall health. It is quite fascinating to consider and the horses can be incredibly discerning as they walk about ignoring what we might expect them to devour (fresh blades of grass) in favor of a more unusual choice (chaparral)! When you begin taking note of the individual acquired tastes between the horses of your herd and especially if you keep records to further compare data through the years, the evidence—though circumstantial—carries even more weight. The formal study of plants being used by animals in their native habitat for medicinal value is referred to as zoopharmacognosy and it seems to be a continuously growing field of study, which I think is marvelous. Of course, humans have observed wild animals and utilized them as sources from which to derive examples of herbal medicine since prehistoric times. But it’s nice to see that after generations of scoffing this previous association of learning, we are now returning to a relationship where we admit that we can learn something for ourselves, by understanding how wild animals survive and keep in good health. American biologist Michael Huffman, who has worked for many years in Japan at the Primate Research Institute at Kyoto University, described a widely used criteria for judging when an animal is self-medicating, based on his studies of primates. His evidence that African apes were ingesting food for medicinal value was based on documenting the following in his observations: plant species which are not a regular part of the diet, habit of ingestion which provides no additional nutritional benefit to the animal, restriction of plant use to seasons or other periods associated with high risk of parasitic infection, illness or parasite infection of the individual at the time of ingestion of a putative medicinal plant, a subsequent positive change in this condition following ingestion (Huffman, Michael A. WILEY-LISS, INC, 1997. Current Evidence for Self-Medication in Primates: A Multidisciplinary Perspective.). Much of the evidence for self medicating that was documented by Huffman discussed gastrointestinal upset and changing levels of parasitic infection. This is a great place to start because parasites most certainly are a common and recurring malady for all mammals and the parasitic burden or remedy can be most easily authenticated by those evaluating them. However, we can also expect that as evidence and interest in zoopharmacognosy continues to grow, we will find that self medicating in animals is being applied to a variety of illnesses and system imbalances, it is a common behavior both instinctual and learned, and it is a reliable method of healing for animals that are allowed the freedom of a natural and varied environment…an environment from which these animals have singularly adapted and collectively evolved for hundreds of years. Of course, domesticated animals are not often allowed that same freedom. We keep them in stalls and kennels and cages, usually feeding them the same amount of the same processed foods for every single day of their life, without taking into consideration the various individual requirements and how (and how often) those requirements may change. In an effort to always best replicate a more natural existent for my own animals, I do believe that providing whole foods and allowing my animals to choose their diet is a preferable approach whenever possible. For my horses, I keep them on quality grass hay and offer soaked beet pulp with whole oats, in addition to a free choice variety of seeds, vegetables, and fruits. Papaya—high in vitamin C, which is a powerful antioxidant. We find an abundance of the B vitamins folic acid, pyridoxine, riboflavin, and thiamin in papaya too! Although horses are able to generate their own B vitamins, a deficiency might show in signs of diminished energy levels or inadequate hoof health. There are 212 amino acids and also several enzymes found in papaya. One such enzyme is papain, which has an anti-inflammatory effect on the stomach. This is why I recommend fresh papaya be added to the diet of any horse that suffers ulcers! Papaya is also high in potassium and fiber. The seeds have been used to eradicate ringworm. Apple—especially high in antioxidants catechin, procyanidins, chlorogenic acid, ploridizin. Banana—a good source of copper, biotin, magnesium, manganese, and fiber. Also an excellent source of potassium! Watermelon—a wonderfully hydrating snack for hot summer days or after a strenuous workout! Full of electrolytes and vitamins C, A, B-Complex. Watermelon also contains a decent amount of fiber, especially when you include the rind! Pear—high vitamin and mineral content. Carrot—a famous treat for horses, carrots are particularly known to be high in beta-carotene. Celery—a very safe addition for horses with metabolic issues, as celery does not contain high amounts of sugar. It is high in fiber, magnesium, phosphate, collagen, and vitamins C, A, and B Complex. Being rich in phenolic phytonutrients gives celery an antioxidant and anti inflammatory property that makes it a favorite addition any time one of my horses suffers a bit of laminitis! Nettles–nettles are an excellent source of iron, in addition to many other minerals. Our equine diets are often lacking in iron, which is why nettles are a favorite of mine around the stable! They work to strengthen the entire body, but are especially helpful in soothing allergic responses. You can feed 1/2 a cup daily or offer them free choice! If you have access to fresh, let them sit in the sun for a bit or flash boil them prior to feeding. You could even toss a handful of them in your horse’s water trough! Pumpkin—pumpkins are bursting with carbohydrates and full of fiber! They are also an excellent source of vitamin C, A, and E. They offer good amounts of minerals magnesium, zinc, niacin, manganese, copper, selenium, and iron. Raspberry Leaf–this is an excellent option for our mares, particularly! Raspberry leaves can help to regulate the hormones in our mares, while toning and strengthening the uterus which helps to benefit fertility, pregnancy, and foaling. Like nettles, I offer 1/2 cup daily to their soaked beet pulp or I toss fresh leaves in their water trough! Cilantro—another one that is excellent for lamanitic horses, cilantro is an excellent anti-inflammatory herb! The oils of the leaves are antimicrobial, and the plant is full of phytonutrients, flavonoids, phenolic acid compounds. Parsley—also an herb known for its anti-inflammatory properties, parsley has shown excellent results in aiding treatment for arthritis. It is a diuretic and commonly used to control urinary tract infections, kidney stones, and gallbladder stones. I always include it if a horse is showing edema in the legs. Beet—absolutely another favorite whole food to feed my horses! Beets are very rich in various minerals and vitamins, although they do have the highest sugar content of any vegetables. They are particularly high in nitrates, which are linked to lowering blood pressure and positive enhancement of athletic performance. Spinach—a rich leafy green high in vitamins and minerals, but I only offer a small handful at a time. Too much can make horses gassy and it isn’t uncommon for my horses to leave the spinach to the rabbits as leftovers. Dandelion Greens—an excellent source of vitamins A, B complex, C, D, E and K. They are also high in minerals like magnesium, potassium, iron, and calcium. They are an excellent green leafy food for our horses, with a higher margin of safety than spinach or kale. This has made dandelion greens referred to as “the horse’s lettuce” by equestrians. I also offer grapes/raisins, cantaloupe, squash, cucumber, lentils, sunflower seeds, hemp seeds, chia seeds, garlic, turmeric, mesquite beans, sprouts, and various powdered herbs that I use for their deworming benefits. Be creative and have fun with it! But do always check to make sure a food you might offer is not toxic to your horse and always go for small quantities of each one you include. Be extra careful about offering too many fruits at once, just because you have to think about the increased sugar intake. And for horses that have metabolic issues or insulin resistance, you have to be even more aware of what you feed. I don’t worry too much about my horses pushing some foods aside and I usually always offer them again in the future. They change their minds and it’s all about choices! Pay attention to what each horse readily devours and take note of what that particular fruit or vegetable is most known for, as this could be a clue to what your horse is lacking or seeking to balance within its system. I do not recommend you offer them too much of any one food at once, but you can think about other ways to offer more of the ingredients they seem to be craving. They are more intelligent and conscious then we usually give them credit for, the whole idea is allowing them the freedom to make their choices as they would in a ideal wild habitat. I recommend always having loose mineral salt available in their living environment and I even offer food grade diatomaceous earth, which is very rich in minerals, as a free choice supplement. I often hear owners use the terms laminitis and founder interchangeably. But though the two ailments are certainly related, they are entirely separate in action and severity. It is important that we distinguish the two properly, when reacting to and treating our horses for sensitivity and lameness. Most of us know that the hoof capsule contains three bones; the coffin bone, the navicular bone, and the distal short pastern bone. Our focus with founder is in regards to the coffin bone, which serves to protect nerves and blood vessels, while providing an attachment for the deep digital flexor tendon. The corium is a vascular network that supplies blood flow to the hoof and surrounds the coffin bone. Along the dorsal side of the corium, we find it surrounded with a beautiful layer of sensitive laminae, which is itself surrounded by the insensitive laminae. The insensitive laminae continues outward to form the inside of the hoof wall. The two laminae are both made up of primary epidermal laminae and secondary epidermal laminae, and the vascular tissues are interlaced so strongly that they are quite difficult to pull apart! Together, they work to support the coffin bone and also the weight of the horse. Their health and integrity is essential to the hoof form and function! I consider laminitis a symptom of disease and a precursor to founder. By common definition, laminitis is an inflammation of the sensitive laminae tissue inside of the horse’s hoof. But the Merck Veterinary Manual now describes laminitis as “a transient ischemia associated with coagulopathy that leads to breakdown and degeneration of the union between the horny and sensitive laminae.” Either way, the result is the same: the enter-laminae bonds become compromised and weaken, causing constriction of blood flow and a great deal of pain to the horse. In cases that are not managed or allowed to correct, these bonds can be completely destroyed and now the horse has foundered, causing the coffin bone to drop within the hoof. Founder is a mechanical event and a severe one, but it did not happen suddenly to the horse and it is rare that we see it take place in healthy, unrestricted hooves. As a hoof care professional, I see evidence of laminitis more often than most owners want to acknowledge. While we should never ignore the signs of laminitis in our horses’ hooves and they vary in degrees of severity from extremely mild to very severe, I do believe we need to start looking at laminitis more calmly and with a better understanding of how common an occurance it is. From that composed and aware state of mind, we can analyze the general husbandry of our horses and start making appropriate changes for the betterment of their overall health. Symptoms range from a fairly benign tenderness of the hoof to a more pronounced unwillingness of the horse to walk on its own or an insistence to stand in a way that shifts the weight off of their front hooves. In my experience, most owners entirely miss the mild symptoms of laminitis and this is unfortunate because here is your best moment to modify your horses’ husbandry before any further damage is done. Acute laminitis brought on by sudden climate or feed variations may last a few days or even a few weeks before subsiding, assuming the cause is eliminated or easily balanced. In healthy hooves, which belong to horses that are allowed the freedom to seek what they require (eg. standing at length in water, increased or decreased movement, change of terrain, change of diet) short periods of laminitis may come and go relatively unobserved and without lasting damage. I think of it as a fever of the hoof! The problem is that most of our domestic horses are not afforded those choices and so, problems increase in severity if we are not listening and making approprite adjustments. Chronic laminitis has been existing in the hoof for quite some time and the evidence is displayed in the hoof, whether or not the horse reacted strongly to it occurring. A hoof care professional can observe certain pathologies such as heels growing quicker than toes, divergent hoof rings which are wider or lower at the heel than at the toe, a straight hairline at the coronary band, and a stretched white line of the hoof. An owner may tell me “this horse has never taken a lame step”, but I can always see the truth displayed in the hoof. I usually see chronic laminitis when trimming obese horses, horses permitted only a very limited opportunity for movement, and horses consistently stabled in unvaried and static conditions. These horses are often in more trouble than the former and even without dramatic rotation of the coffin bone, their hooves will take more than a few cycles to rehabilitate. What about wild horses? Many of us often look to the wild horse when considering how to better balance the health of our domestic horses. Do wild horses also suffer laminitis? The answer is yes! 40% of 56 Kaimanawa region (New Zealand) were diagnosed with laminitis. These horses were still thriving as much as they would have, considering the circumstances of their environment. Interesting to note that the horses living on the most lush vegetation have the highest percentage of laminitis. Horses did not adapt to live off of abundant amounts of rich feeds! Even still, the wild horses are generaly allowed the freedom to seek out what they require to heal and that is a significant difference between them and their domestic relations. Wild horses are certainly not on “stall rest” and they are not medicated, except by their choices of available vegetation. Their hooves, though they vary drastically from horse to horse and do not all represent what we think when we think of ideal barefoot hooves, remain unrestricted by shoes and are able to expand and contract upon weight bearing. They go through episodes of laminitis, but they are clearly able to manage and they are not foundering all over the range. Why? Choices, increased movement, unrestricted hooves. In closing, I want to reiterate that laminitis while common, is still an alert to a greater problem that requires our attention! While some owners despair, I think we’re lucky the horse sends us an alarm! We then get our chance to look calmly at what might have spurred the incident (stress factors, toxins, change of feed, change of habitat, inappropriate feed, illness, etc.) and we get a chance to very likely fix the issue—not mask it, but fix it. Your horse is sending you a message. Accept it, keep your composure, build your team of equine professionals, and get to work solving the husbandry issues that are causing disease. *When suspecting laminitis and evaluating your horse, don’t put so much trust in the common advice heat in the hooves being a diagnostic indicator. For one thing, barefoot horses are known to be more consistently warm in their hooves because their hooves are functioning as intended and the laminae are distributing energy actively and evenly. Blood flow can still be constricted in an incorrect trim or rehabilitating hoof, but usually the hoof is still performing better than it would be with shoes. In addition, so many environmental factors and activity levels can change the temperature of the hooves throughout the day. Using hoof wall heat as a diagnostic indicator will only be useful if you are aware of your horses’ normal average. In Arizona, monsoon often brings struggles with thrush in the hooves of many horses. In other parts of the country, where the weather is damp year round, thrush might be a constant concern. We can recognize a serious case before we even lift the hoof, by detecting the awful smell just by the horse walking near us. Certainly, we can see it once we do have the hoof in our hand; the frog is usually the center of infection and thrush is often evident in an unhealthy central sulcus when it is deep and sensitive, instead of shallow and resilient. It will also follow along the collateral grooves. If allowed to continue unchecked, the infection can grow so ferocious that it can spoil the entire corium of the frog, cause the digital cushion to become diseased, and even harm the deep flexor tendon where it attaches to the coffin bone. You’ll only have these feeble slivers of nonfunctional frog and your horse will exhibit increased sensitivity, especially in the heel area of the hoof. Eventually, this can result in complete lameness. 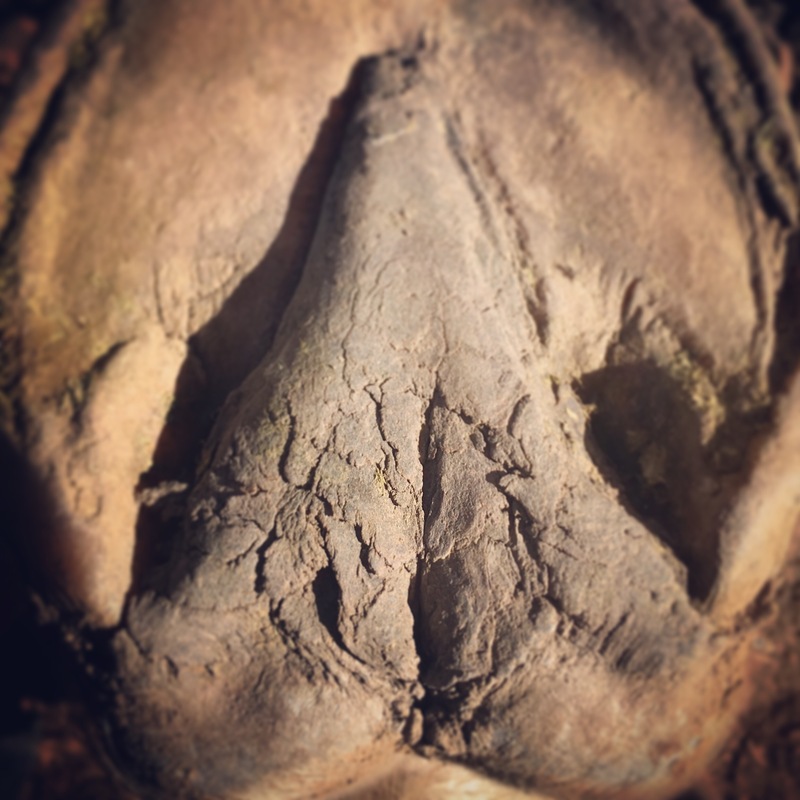 There is an ongoing debate as to whether thrush is a bacterial infection (Sphaerophorus Necrophorus) or a fungal one (Candida Albicans) and I’m sure it can be either one or the other or both…but what we do know, is that it is an unwanted intrusion to our horses’ hooves and we need to be diligent in preventing it! In my experience, healthy barefoot horses rarely suffer thrush at all. So, let’s talk about why that is! First and foremost, movement. Some of this can still apply to a well shod horse, but it applies most completely to a barefoot horse. There is strong evidence that horses who are stabled and prohibited in their freedom to move on varied terrain for much of their day, often battle thrush more than others who are allowed ample space to roam. With the freedom to walk, trot, and gallop over a clean environment, as horses were designed to do, the hoof is constantly being worn and cleaned of collected debris and dead tissue. Obviously, when we confine them to a stall or small corral, without opportunities to exercise regularly and especially if clean conditions are not maintained, we cancel the hoof’s ability to preserve itself naturally. But even with nearly immaculate husbandry practices and an adequate turnout setting, thrush can still be a problem for some hooves. This is where we leave the symptoms behind and go straight to the root cause: hoof contraction. A hoof that is contracted is a hoof that will have poor circulation. A hoof with poor circulation will have slow growth. A hoof with slow growth will have excess horn on which thrush will feed. And the whole thing is a vicious cycle! Overgrown and impacted bars are probably the most common culprit of inhibited circulation in our horses’ hooves—the bars and how to correctly see and trim them, seems to often be the most misunderstood element of all. Of course, there are various cases of bar neglect, with some quickly healed by a correct trim and others taking a bit more time. In severely neglected bars, they are actually forced upward and inward, inside of the hoof. This action basically causes everything else to also compress and pinch, such as the frog corium. Of course, increased pressure is put on the palmar digital artery too and it cannot function as it was intended. All this limitation creates the perfect opportunity for thrush to enter and thrive, further compromising the already compromised hoof. Minor thrush can be easily combated with daily rinses of apple cider vinegar. Keep the crevices of the hoof as clean and open to oxygen as you can. Often, if I encounter a serious case, I will use a few drops of iodine complex to treat. But this is a very concentrated treatment and while it does work well, we should not have to not rely on it! We must treat the cause, not only the symptoms! Or you will be emptying thrush treatments every month because you are still providing the perfect environment for bacteria and fungus and thrush is a destructive opportunist. I only use iodine treatments to help a client along initially, but the real and lasting treatment is in the trim! For a more detailed explanation of what causes thrush and also more information on the fundamentals of barefoot trimming I have come to recommend, please visit the websites for Hoof Help Online and The Horse’s Hoof. Pictured is a beautiful and healthy frog! After a morning of reviewing articles and speaking with colleagues, I’ve been thinking that it is no wonder most owners have such a hard time choosing the correct path for their horses. Whether we are farriers/barefoot trimmers, equine dentists, equine sports therapists, acupuncturists, nutritionalists, trainers, or even veterinarians…the majority of our clients are just casual horse enthusiasts. It isn’t their career, it is only their hobby. With the amount of information being shared, both correct and incorrect, it is no surprise to see how difficult it can be to make sense of it all. But the advice is all very similar and the basic guideline is the same: stay committed, stay consistent, be responsible. I recently took on a new client that hired me to remove the shoes of four horses and start hoof rehabilitation through barefoot trimming. These horses each have several concerns that all complicate each other such as misalignment, muscle soreness, thrush, teeth, mineral deficiencies, etc. None of them had ideal hooves, not even remotely. It’s all common enough to witness, when dealing with new horse owners. Far too common, unfortunately. It is still possible to solve everything easily, with patience and education, but it is going to take a lot of both. Initially, in this case, I did not want to get involved at all at this barn because I know trouble when I see it and you simply have to recognize that you cannot help every horse if the owner is that unaware from the start about their healthcare requirements. For example, if the owner doesn’t even recognize that their horse is not sound before your arrival…you are starting an uphill battle. But my internal hope got the better of me and I was convinced that my knowledge and experience would be followed and trusted. Instead, it took two weeks after the first trim, for me to be fired and another farrier hired. Two weeks! None of my other health recommendations were started or followed with diligence and my knowledge was constantly questioned and challenged. Covertly, several people were brought in to critique my trimming. Because I was not there, I cannot know what was said and because I do not know the reputation or credentials of the consults, it basically doesn’t matter. The thing is: I had barely done any work on these hooves yet! When you first remove shoes from a horse that has been shod for years, it is best to not be overly aggressive and just allow the hoof to relax on its own for a moment. Let the hoof reveal itself to you, once the constriction of metal is eliminated and the hoof can move again. Give it some time. In some horses, the hoof is still thriving and it will reveal itself very quickly. In other horses, the hoof is not thriving, often due to inadequate husbandry, and these hooves will take more time before they start to show you what they need. But eventually, you can always get to that place. Then you start to trim to what you see in each hoof; you’re not trying to strictly force the perfect hoof form you have imagined, but you are trimming each individual hoof by its own guidelines, which are unique to each horse. And you are giving it time! With this client, I wasn’t even given the chance to see this process begin. So, however my trimming style was judged by others, the humorous part is that I had not really trimmed much at all! The owner doesn’t know that and the other people brought in for their opinion do not know that…all their critiquing I most likely would have agreed with, had I been involved with the assessment, because I also thought these hooves were basically very unhealthy and flawed. This case almost broke me, as it followed several other new cases of serious neglect that have been hard to process and have required a lot of my resources. Everything hit at once! But after reaching out to mentors and colleagues, I’m at a place now where I can laugh at the folly of it all and move forward again. We’ve all been there. Unfortunately, we’ll all be there numerous times again. We literally cannot escape it, unless we change careers. It does help to keep a close community, where we can lean on each other when needed. Horse(s) with several health concerns simultaneously existing. This is especially true when the owner has not already recognized or begun to address the issues. I cannot stress that enough! If you arrive to a new client, supposedly to address one concern, but immediately have a mental list of numerous considerations that need attention, proceed with extreme caution or do not proceed at all. This is very hard to do for most of us, but oftentimes we must. This characteristic will often be there with first-time horse owners and if they are truly willing to learn, they can often be worth your efforts to teach. But still be careful and protect yourself. Owners who are blowing through professional opinions in a very short length of time. We’ve all heard these ones talk! The fact is, if you have gone through four farriers or four veterinarians or four trainers in a year…the problem is almost always the owner. Because as practitioners, we do all vary here and there in our techniques or opinions, but assuming we are qualified and experienced in our field, we are not all that different at the end of the day. It may be just a series of bad luck for the owner, but generally it isn’t. That all being said, we must also find space to forgive these owners if we can. Because as I wrote in the opening of this post, they have so much information, both correct and incorrect, being pushed on them by so many sources, that it must seem overwhelming. It must be even more difficult for them to process and make sense of it all, than it is for us. We have been doing this for years! We have a community of mentors and colleagues! This is everything we have focused our education and efforts towards! Breeding, rearing, training, and maintaining healthy equines. We know it isn’t easy and we know it isn’t without our continuing education, commitment, consistency, and responsibility. We know it is a challenge. But the casual owner just wants to ride their new horse on the trail a few times a week, without any issues. And I have to laugh, apologize to the horses, and forgive that misguided human trait. Because it is entirely out of my control. And it is out of your control too. I seem to notice that if I am joyous and skipping through the woods, following my collared up dogs through their hunting with a lightness to my step and easy beating to my heart, that they will see my good nature as a pass for absurdity. I will find them wrapped up in a blasphemous game, such as an entire pack joined in on a porcupine. I’ll end up pulling quills for hours upon hours in the field until the sun is rising and cursing them to hell and back for my bloody efforts. But if I’m sad, deeply sad, heavy with layers of sorrow and walking along the forest path unengaged with the world around me, the pack will do something extraordinary. They’ll tree a robust bobcat in the middle of a thunderstorm. And they’ll do it as though it was just a simple task which they could have always done, had I only asked it of them! And I just get to stand there and find myself smiling again with the darkness lifted from my soul, even in the pouring rain. Comparatively, their power to uplift my injured spirit is more significant than their tendency to further complicate my somber disposition. Oftentimes, my most heartbroken and painful days will turn into my best memories because of my animals’ responses to my emotion. They treat me gently and carefully, when I am mournful and hurt. They become less forceful and trying. They seem to accept my direction effortlessly and connect with me more comfortably. It reminds me of how open and soft I am when I have been wounded. I become gentle. I become fragile. And I believe that the animals might find it easier to work with that energy, than they do when you are championing the world. Insufferable little paint horse, always challenging me on my best days. And I wouldn’t mind and we’d walk through the entire night, quiet and alone in our thoughts. I wouldn’t need to guide him or even urge him forward; he’d just walk in familiar directions and take me along comfortable scenes, visiting places where we had made better memories in our past. Peaceful breath. Attentive ears. Soothing stride with a careful stepping of his hooves. And by sunrise, we’d be turning in the direction of our home or just stepping out of the forest to see its gate. It was all by his own design, the entire ride. And have you ever sat on a tall white horse with enormous movement, in an empty field lit by the moon, with tears in your eyes and your entire body weak, and him dancing for you simply because it would help you feel happy again? Piaffe. Passage. Pirouette. You asked him so lightly because that was all you could do, and he responded. You are reminded that your cues should always be this gentle and open because feel how easily the horse can respond! It might not sound like the most beautiful thing in the world, but it is. I only needed that midnight dancing once and I’ve never quite had the same grace out of this since, though we continue to develop a deep understanding of each other and have become trusted friends. This post is a little consideration on natural medicine as it applies to the health of the animals we keep, focused on parasites and regarding the theory behind the methods. In the future, there will be additional posts more specific to recipes and practice. For the past 10 years, I’ve been using a natural and gentle deworming protocol in my horses and dogs, to a very favorable outcome. I most commonly rely on an herbal formula and along the way, I always encourage gut health with probiotics. To me, one of the greatest things about herbal deworming is that you’re making the host inhospitable or undesirable to live worms, while still fully supporting the immune system of your animal. This idea also relates to other dietary supplements like garlic and pumpkin seeds, which also limit and prevent parasites. For example, garlic, turmeric, pumpkin seeds, parsley, and cloves all have additional benefits to the overall health of your animal; they all contain varying degrees of antimicrobial and antibacterial properties, they are rich in antioxidants, vitamins, and minerals, they fight inflammation, soothe the stomach, and help eliminate toxins. Whereas, anthelmintic drugs have one goal and one goal only—to eradicate the parasites. There is a benefit, perhaps, to the one-dose, no-hassle, routine of these drugs. But it is worth mentioning that the very easy and common access is strongly related to why we now have parasites building an immunity to them! In the case of Ivermectin, which was originally extracted from a soil fungus, it is generally accepted as safe in mammals because mammals do not have glutamate-gated chloride channels in their muscle cells, and binding to these glutamate-gated chloride channels is how the parasites are paralyzed (1). But some animals can go into a system shock when given Ivermectin, especially if their health is already compromised or stressed. The medication is strong and toxic reactions can be severe. Of course, this could be true for any supplement, but again, is there an added benefit to outweigh the risk? I just forced a very strong drug into my animal’s system and it did as intended, but did it support anything else in the body? In the case of anthelmintic drugs, I have not found any evidence to support an added benefit to the overall health of the animal, besides killing any parasites that were hosted. In 2008, a scientific study was done comparing the effectiveness of Ivermectin to garlic (2) . Garlic proved to be every bit as effective! During this recent year I have been moving about the country and in doing so, unintentionally did my own experiment in the overall health of my animals by neglecting my herbal protocol and relying on conventional veterinary products to get us along during our travels. The results have been ghastly; dull and uneven growth in coats, noticeably diminished endurance, stomach upset, ear infections, disabling giardia, consistently battling parasitic infestations and in one of my horses, a robust return of Cutaneous Habronemiasis (summer sores). Do I attribute all of this to the use of anthelmintic drugs? Maybe not. But it is definitely worth my noting because none of these issues had ever stricken my animals before and/or never stricken them so severely. Though we were traveling, the only thing that really changed for any of them, was the switch from herbal deworming methods to the more common medications. I do not feel like I even had as strong of a handle on parasites, despite following recommended protocol, and I lost the additional health benefits of my herbs. It goes without saying, we are now settling in again and going back to our normal routine! It has only been a few months and I already see the benefits. It’s also important to remember, that animals and humans are able to play host to a variety of parasites, within reason. We are never going to eliminate every parasite from their bodies or our own and we probably shouldn’t be trying. In the wild, I think it is safe to assume that animals are capable of seeking out the diversity in plants they may require in their diet, as they may require it. I’ve studied my own horses doing so, when they have been offered abundant native land with which to graze freely. I have witnessed their careful selections and I’ve noted the changing preferences throughout the seasons. I have seen my dogs do the same. If they could always roam a plentifully mixed territory, as they were designed, it might be safe to assume that I wouldn’t have to intervene in their health except in rare circumstances or as they became of great age and diminished strength. So, why are so many responsible and diligent owners still set against a holistic angle when considering their animals’ health? Why is it still more common than not, to be met with a rolling eye when you offer advice on herbal deworming? I have often listened to friends claim that they have tried herbal deworming, but it did not offer good results. Professionally, I’ve spoken to people referencing their clients who are experimenting with herbal formulas, but still bringing dogs or horses into the clinic with heavy parasitic loads. Because my own experience has been so entirely opposite, it can be frustrating to hear these stories. I think one of the reasons that some people do not have immediate and lasting success with herbal dewormers is due to lacking a full understanding of the approach; they are not thoroughly committed in a holistic view of their animals’ entire health and it’s also likely many are using incorrect dosages. I believe herbal deworming is more beneficial to the whole dog or horse, but it isn’t simpler. And what works today for this dog or horse, might not work next year. It also might not work identically for every dog or horse. They are individuals and their requirements are often unique.